Widespread Terror! The German Persecution of Polish Jews During the Holocaust. 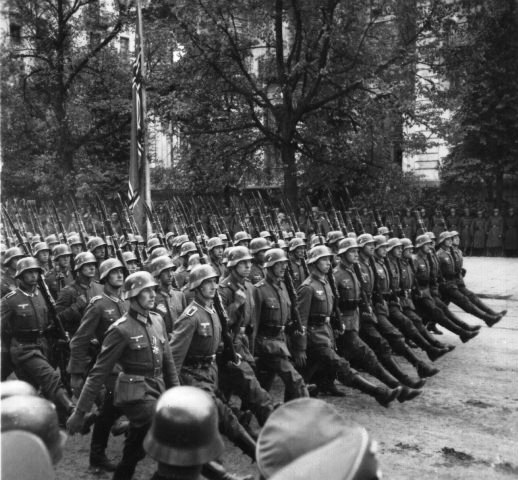 The German invasion and subsequent occupation of Poland triggered the persecution of the Polish and Jewish population. The mass murder and ill treatment of Jews was often carried out amidst scenes of utter barbarity and contempt for the Jews, whom the Germans regarded as Untermensch (sub-human). “A Polish policeman in uniform was shot while on duty on November 13 in Warsaw at Nalewki 9 by a Jewish gang. A second official was dangerously wounded by a shot. The occupants of the house at Nalewki 9, hampered the search for the murderers, who had fled, by offering open resistance. In the meantime the police succeeded in tracing the murderer, a Jew and professional criminal, Pinkus Jankiel Zylbring, who on account of the war had been prematurely released from prison. In his possession was found the weapon used for the murder. Because of their reprehensible conduct during the police investigations, fifty-three male Jews from the house, Nalewki 9, were shot. When German soldiers attempted to loot the business of Stephen Luxemburg, a Jewish goldsmith in Warsaw, he shouted for help. The soldiers left, but others soon came to search the premises and found German rifle bullets, which of course, they themselves had brought. Luxemburg was then taken out and shot. Mr Hoffman the proprietor of the Café Esplanade, and a well-known citizen was executed on a charge of sabotage which consisted in leaving his job when put on forced labour. “A man with markedly Semitic features was standing quietly on the sidewalk near the curb. A uniformed German approached him and apparently gave him an unreasonable order, for I could see that the poor fellow tried to explain something with an embarrassed expression. Then a few other uniformed Germans came upon the scene and began to beat their victims with rubber truncheons. They called a cab and tried to push him into it, but he resisted vigorously. The Germans then tied his legs together with a rope, attached the end of the rope to the cab from behind and ordered the driver to start. The unfortunate man’s struck the sharp stones of the pavement, dyeing them red with blood. Then the cab vanished down the street”. When a fire broke out in the town, the Jews were blamed, and all who remained – 600 men, women and children were taken to the outskirts and murdered. Eight hundred Jews of Przemysl are said to have been led across the bridge to the German occupied part, where most of them were put to death. 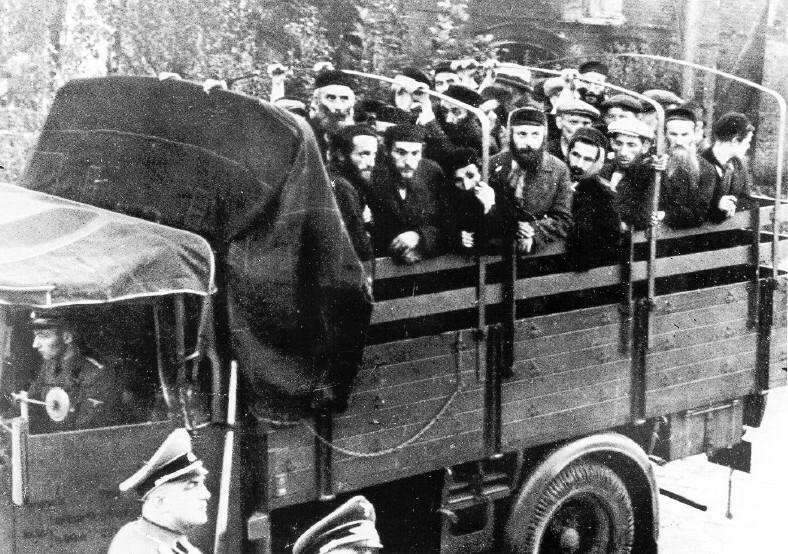 Eighty-three Jews were shot between Chelm and Hrubieszow. They were part of a group of several hundred Jews driven out the two towns by the German military command. They were put to death, because when the Germans ordered them to run in the direction of the frontier of the Russian –occupied areas, they did not run fast enough. In January 1940 German police officers boasted that during house searches in the small town of Lask, one hundred Jews were shot. Outside a synagogue in the same town a crowd of Jews tried to prevent the Germans from entering. The Nazi police used their guns killing several hundred Jews. 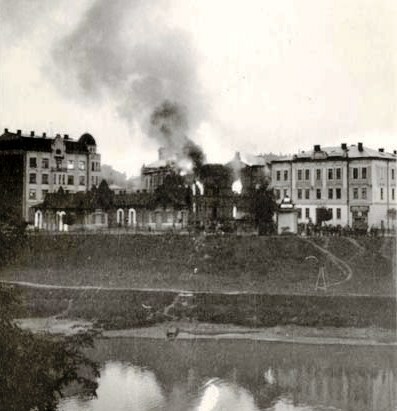 The synagogue was razed to the ground. From Cities to Villages - The German persecution of the Polish Jews!